Frustration, Discouragement, Irritation, Depression, Lack of Motivation… Just some of the negative feelings that we can experience in a day that keep us from the life that we could be living. We are all human, we all have felt some, or all of theses at one time or another. For some of us we are in a constant cycle of going from one of these to the next, over and over, and as we get more frustrated and down, it just seems as if we just can’t get a break. The dominoes just seem to keep falling over. So how come it seems that some people never seem to go through any of these down times? How come some people always see any obstacle as an opportunity…Or they just don’t see the obstacle at all, as if it doesn’t even exist. Are they different someone in how they are built? Are they somehow immune to these things? No, they have the same brain, blood and organs as the rest of us, but, there is one thing that is different…They use their brains in a different way than most of us do. These people don’t allow these negative thoughts or feelings to take up residency in their mind, they have a constant anti-virus program running in the back of their mind that destroys those thoughts and feelings as they show up, so their thoughts, lives, and results can never be infected. This is, for most of these people, a learned and practiced behavior. There are some lucky people that this is just natural for, but for most, it is something that is learned and they constantly worked at it, so it became second nature for them. Why is it easier to feel the bad stuff, and believe the negative, self defeating talk that goes on in our heads all day? When we know that we create our own world by the thoughts we think every second, why would choose to create a world full of thorns and misery, when instead we can have a path of happiness and roses? Most of time it is just a matter of awareness. When we become aware that our thoughts become things, we must then learn to focus those thoughts on an almost constant basis. It’s hard work. Rewarding beyond belief… but yes, hard! This is where I have learned the “anti-virus” technique of having a positive mantra running in the back of my mind at all times. When things are coming at me in a negative way, or my thoughts go into doubt mode, or I begin to feel any of those negative emotions mentioned above, I have several positive mantras that are constantly there to zap any negative idea or feeling. They are my soldiers at the gate that will not let the army of self defeat infect my world. My mantra begins, “Because I am so happy and grateful, I am now___________.” I fill in the blank with a goal that I desire in my life. I always say this to myself, as if I have already achieved it and it is mine. I am not always good at it, sometimes I am great, sometimes not so great, but day, by day, by day, I get a little bit better… It has become a natural thought process for me at most times. Sometimes I really have to pull my thoughts in when they go off track, but that happens less and less every day. I will be one of those people who just seem to never have a worry or an obstacle. I work on it every second. It is something that I see for myself so clearly. I keep my objective in my line of sight every where that I look to ensure success. I hope that in sharing with you what I have been learning, that you may begin to shift your thoughts also. This is all part of how I believe we can begin to change things in this world. We can help each other stay in positive flow, and when we do, we can’t help but touch the people around us in a better way. 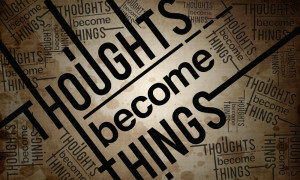 Our thoughts truly become things… So let’s all think amazing ones!